The EM Algorithm and Extensions. Second Edition. Ahfock, D. and McLachlan, G.J. (2019). Missing data patterns in semi-supervised learning. ePreprint arXiv:1904.02883. Ahfock, D., Pyne, S., and McLachlan, G.J. (2019). Statistical matching of non-Gaussian data. ePreprint arXiv:1903.12342. Nguyen, H.D., Forbes, F., and McLachlan, G.J. (2019). Mini-batch learning of exponential family finite mixture models. ePreprint arXiv:1902.03335. Nguyen, T.T., Nguyen, H.D., Chamroukhi, F., and McLachlan, G.J. (2019). Approximation by finite mixtures of continuous density functions that vanish at infinity. ePreprint arXiv:1903.00147. Lee, S.X. and McLachlan, G.J. (2018). On formulations of skew factor models: skew errors versus skew factors. ePreprint arXiv:1810.04842v2. Lee, S.X., Lin, T.-I., and McLachlan, G.J. (2018). Mixtures of factor analyzers with fundamental skew symmetric distributions. ePreprint arXiv:1802.02467. McLachlan, G.J., Lee, S.X., and Rathnayake, S.I. (2019). Finite mixture models. Annual Review of Statistics and Its Application 6, 355-378. Viroli, C. and McLachlan, G.J. (2019). Deep Gaussian mixture models. Statistics and Computing 29, 43-51. Lee, S.X., Leemaqz, K., and McLachlan, G.J. (2019). PPEM: Privacy-Preserving EM learning for mixture models. Concurrency and Computation: Practice and Experience. (Advance Access, published 05 March, 2019). To appear. Lee, S.X. and McLachlan, G.J. (2019). Scale Mixture Distribution. In Wiley Stats Ref: Statistics Reference Online (WSR), N. Balakrishnan, P. Brandimarte, B. Everitt, G. Molenberghs, F. Ruggeri, and W. Piegorsch (Eds.). Chichester: Wiley. Ng, S.K., Tawiah, R., and McLachlan, G.J. (2019). Unsupervised mixture regression modelling for cluster analysis of mixed data with continuous and categorical features. Pattern Recognition 88, 261-271. Nguyen, H.D. and McLachlan, G.J. (2019). On approximations via convolution-defined mixture models. Communications in Statistics - Theory and Methods 48 (Advance Access, published 30 October, 2018). To appear. ePreprint arXiv:1611.03974. Nguyen, H.D., Yee, Y., McLachlan, G.J., and Lerch, J.P. (2019). False discovery rate control under reduced-precision computation. SORT. To appear. ePreprint arXiv:1805.04394. Tawiah, R., Yau, K.K.W., McLachlan, G.J., Chambers, S., and Ng, S.K. (2019). A multilevel survival model with random covariates and unobservable random effects. Statistics in Medicine 38, 1036-1055. Tawiah, R., Ng, S.K., and McLachlan, G.J. (2019). Mixture cure models with time-varying and multilevel frailties for recurrent event data. Statistical Methods in Medical Research. To appear. Jones, A.T., Nguyen, H.D., and McLachlan, G.J. (2019). Positive data kernel density estimation via the logKDE package for R. In Data Mining (Proceedings of the 2018 Australasian Data Mining Conference AusDM 2018), R. Islam, Y.S. Koh, Y. Zhao, G. Warwick, D. Stirling, C.-T. Li, and Z. Islam (Eds.). Berlin: Springer-Verlag, pp. 269-280. McLachlan, G.J., Baek, J., and Rathnayake, S.I. (2019). Mixtures of factor analyzers for the clustering and visualisation of high-dimensional data. In Advances in Latent Class Analysis: A Festschrift in Honor of Professor C. Mitchell Dayton, G.R. Hancock, J.R. Harring, G.B. Macready (Eds.). Charlotte, North Carolina: Information Age Publishing. To appear. Lee, S.X., Leemaqz, K.L., and McLachlan, G.J. (2018). A block EM algorithm for multivariate skew normal and skew t-mixture models. . IEEE Transactions on Neural Networks and Learning Systems 29, 5581-5591. Lee, S.X. and McLachlan, G.J. (2018). EMMIXcskew: an R Package for the fitting of a mixture of canonical fundamental skew t-distributions. Journal of Statistical Software 83, No. 3. See also CRAN package. Lee, S.X. and McLachlan, G.J. (2018). Risk measures based on multivariate skew normal and skew t-mixture models. In Asymmetric Dependence in Finance: Diversification, Correlation and Portfolio Management in Market Downturns, J. Alcock and S. Satchell (Eds.). Chichester: Wiley, 152-168. Lin, T.-I., Wang, W.-L., McLachlan, G.J., and Lee, S.X. (2018). Robust mixtures of factor analysis models using the restricted multivariate skew-t distribution. . Statistical Modelling 18, 50-72. Lloyd-Jones, L.R., Nguyen, H.D., and McLachlan, G.J. (2018). A globally convergent algorithm for a lasso-penalized mixture of linear regression models. Computational Statistics and Data Analysis 119, 19-38. Nguyen, H.D., Jones, A.T., and McLachlan, G.J. (2018). Stream-suitable optimization algorithms for some soft-margin support vector machine variants. Japanese Journal of Statistics and Data Science 1, 81-108. Nguyen, H.D. and McLachlan, G.J. (2018a). Some theoretical results regarding the polygonal distribution. Communications in Statistics - Theory and Methods 47, 5083-5095. Nguyen, H.D. and McLachlan, G.J. (2018b). Chunked and averaged estimators for vector parameters. Statistics & Probability Letters 137, 336-342. Nguyen, H.D, Ullmann, J.F.P., McLachlan, G.J., Voleti, V., Li, W., Hillman, E.M.C., Reutens, D.C., and Janke, A.L. (2018). Whole-volume clustering of time series data from zebrafish brain calcium images via mixture model-based functional data analysis. Statistical Analysis and Data Mining 11, 5-16. Nguyen, H.D., Wang, D., and McLachlan, G.J. (2018). Randomized mixture models for probability density approximation and estimation. Information Sciences 467, 135-148. Jones, A.T., Nguyen, H.D., and McLachlan, G.J. (2018). logKDE: log-transformed kernel density estimation. Journal of Open Source Software 3(28), 870. Lee, S.X., Ng, S.K., and McLachlan, G.J. (2017). Finite mixture models in biostatistics. In Handbook of Statistics: Disease Modelling and Public Health, Part A, Vol. 36, A.S.R. Rao, S. Pyne, and C.R. Rao (Eds.). Amsterdam: Elsevier, pp.75-102. Leemaqz, K., Lee, S.X., and McLachlan, G.J. (2017a). Privacy distributed three-party learning of Gaussian mixture models. In Communications in Computer and Information Science 719. (Proceedings of the 2017 International Conference on Applications and Technologies in Information Security (ATIS)), Batten, L., Kim, D., Zhang, X., Li, G. (Eds.). Singapore: Springer, pp. 75-87. Leemaqz, K., Lee, S.X., and McLachlan, G.J. (2017b). Corruption-resistant privacy preserving distributed EM algorithm for model-based clustering. In Proceedings of the 2017 IEEE Trustcom/BigDataSE/ICESS. Sydney. Los Alamitos, California: IEEE eXpress Conference Publishing, pp. 1082-1089. McLachlan, G.J., Bean, R., and Ng, S.K. (2017). Clustering. In Bioinformatics, Second Edition, Vol. II: Structure, Function, and Applications. J.M. Keith (Ed.). Totowa, New Jersey: Humana Press, pp. 345-362. McLachlan, G.J. and Nguyen, H.D. (2017). Contribution to the discussion of paper by M. Drton and M. Plummer. Journal of the Royal Statistical Society B 79, 365. Ng, S.K. and McLachlan, G.J. (2017). A unified approach to identify correlated differential features for supervised classification of high-dimensional data. In Data Science, Studies in Classification, Data Analysis and Knowledge Organization, F. Palumbo, A. Montanari, and M. Vichi (Eds.). Berlin: Springer-Verlag, pp. 43-56. Nguyen, H.D. and McLachlan, G.J. (2017). Progress on a conjecture regarding the triangular distribution. Communications in Statistics - Theory and Methods 46, 11261-11271. Nguyen, H.D. and McLachlan, G.J. (2017c). Iteratively-reweighted least-squares fitting of support vector machines: a majorization-minimization algorithm approach. In Proceedings of the 2017 Future Technologies Conference (FTC), Vancouver. Piscataway, New Jersey: IEEE EXPLORE, pp. 439-446. Nguyen, H.D., McLachlan, G.J., and Hill, M.M. (2017). Statistical evaluation of labelled comparative-profiling proteomics experiments using permutation test. In Methods in Molecular Biology: Proteome Bioinformatics, S. Mathivanan and S. Keerthikumar (Eds.). New York: Humana Press, pp. 109-117. Nguyen, H.D., McLachlan, G.J., Orban, P., Bellec, P., and Janke, A.L. (2017). Maximum pseudolikelihood estimation for a model-based clustering of time-series data. Neural Computation 29, 990-1020. Aghaeepour, N., Chattopadhyay, P.K., Chikina, M., Van Gassen, S., Kurs, M., Malek, M., McLachlan, G.J., Qui, P., Saeys, Y., Stanton, R., Tong, D., Wang, K., Nolan, G., Finak, G., Gottardo, R., Mossman, T., Scheurmann R., and Brinkman, R. (2016). Benchmark for evaluation of algorithms for identification of cellular correlates of clinical outcomes. Cytometry: Part A 89A, 16-21. Ahfock, D., Pyne, S., Lee, S.X., and McLachlan, G.J. (2016). Partial identification in the statistical matching problem. Computational Statistics & Data Analysis 104, 79-90. García-Escudero, L.A., Greselin, F., Mayo-Iscar, A., and McLachlan, G.J. (2016). Robust estimation of mixtures of skew-normal distributions. In Proceedings of the 48th Scientific Meeting of the Italian Statistical Society (SIS2016), Salerno. M. Pratesi and C. Perna (Eds.). Fisciano, Italy: Dipartimento di Scienze Economiche e Statistiche, Università degli Studi di Salerno. Lee, S.X., Leemaqz, K.L., and McLachlan, G.J. (2016). A simple parallel EM algorithm for statistical learning via mixture models. In Proceedings of DICTA 2016 (The International Conference on Digital Image Computing: Techniques and Applications), A. Wee-Chung Liew, B. Lovell, C. Fookes, J. Zhou, Y. Gao, M. Blumenstein, and Z. Wang (Eds.). Los Alamitos, California: IEEE eXpress Conference Publishing, pp. 295-302. ePreprint arXiv:1606.02054. Lee, S.X. and McLachlan, G.J. (2016a). Finite mixtures of canonical fundamental skew t-distributions: the unification of the restricted and unrestricted skew t-mixture models. Statistics and Computing 26, 573-589. Correction. ePreprint (2014) arXiv: 1401.8182. Lee, S.X. and McLachlan,. G.J. (2016b). On mixture modelling with multivariate skew distributions. In Proceedings of COMPSTAT 2016, Oviedo. A. Colubi, A. Blanco, and C. Gatu (Eds.). The Hague: The International Statistical Institute/International Association for Statistical Computing, pp. 137-147. Lee, S.X. and McLachlan,. G.J. (2016c). Unsupervised component-wise EM learning for finite mixtures of skew t-distributions. In Lecture Notes in Artificial Intelligence 10086 (Proceedings of ADMA 2016, the 12th International Conference on Advanced Data Mining and Applications), J. Li, X. Li, S. Wang, J. Li, and Q.Z. Sheng (Eds.). Berlin: Springer, pp. 692-699. Lee, S.X., McLachlan, G.J., and Pyne, S. (2016a). Modelling of inter-sample variation in flow cytometric data with the joint clustering and matching (JCM) procedure . Cytometry: Part A 89A, 30-43. ePreprint. Lee, S.X., McLachlan, G.J., and Pyne, S. (2016b). Application of mixture models to large datasets. In Big Data Analytics, B.L.S. Prakasa Rao, S.B. Rao, and S. Pyne (Eds.). New Delhi: Springer, pp. 57-74. Lin, T.-I., McLachlan, G.J., and Lee, S.X. (2016). Extending mixtures of factor models using the restricted multivariate skew-normal distribution . Journal of Multivariate Analysis 143, 398-413. Lloyd-Jones, L.R., Nguyen, H.D., McLachlan, G.J., Sumpton, W., and Wang, Y.-G. (2016). Mixture of time dependent growth models with an application to blue swimmer crab length-frequencey data. Biometrics 72, 1255-1265. McLachlan,G.J. (2016). Mixture Distributions - Further Developments. In Wiley Stats Ref: Statistics Reference Online (WSR), N. Balakrishnan, P. Brandimarte, B. Everitt, G. Molenberghs, F. Ruggeri, and W. Piegorsch (Eds.). Chichester: Wiley, 1-13. McLachlan, G.J. and Lee, S.X. (2016). Comment on "On nomenclature for, and the relative merits of, two formulations of skew distributions," by A. Azzalini, R. Browne, M. Genton, and P. McNicholas. Statistics & Probability Letters 116, 1-5. ePreprint (2016) arXiv:1601.00773. ePreprint (2014) arXiv:1404.1733. McLachlan, G.J. and Rathnayake, S.I. (2016). Mixture models for standard p-dimensional Euclidean data. In Handbook of Cluster Analysis, C. Hennig, M. Melia, F. Murtagh, and R. Rocci (Eds.). Boca Raton, Florida: Chapman and Hall/CRC, pp. 145-172. Ng, S.K. and McLachlan, G.J. (2016). Finding group structures in "Big Data" in healthcare research using mixture models. In Proceedings of the 2016 IEEE International Conference on Bioinformatics and Biomedicine (BIBM 2016), Workshop on Health Informatics and Data Science, T. Tian, Q. Jiang, Y. Liu, K. Burrage, J. Song, Y. Wang, X. Hu, S. Morishita, Q. Zhu, and G. Wang (Eds.). Piscataway, New Jersey: IEEE Computer Society, pp. 1219-1224. Nguyen, H.D., Lloyd-Jones, L.R., and McLachlan G.J. (2016a). A universal approximation theorem for mixture of experts models. Neural Computation 28, 2585-2593. Nguyen, H.D., Lloyd-Jones, L.R., and McLachlan G.J. (2016b). A block minorization-maximization algorithm for heteroscedastic regression . IEEE Signal Processing Letters 23, 1131-1135. Nguyen, H.D. and McLachlan G.J. (2016a). Laplace mixtures of linear experts. Computational Statistics & Data Analysis 93, 177-191. Nguyen, H.D. and McLachlan G.J. (2016b). Maximum likelihood estimation of triangular and polygonal distributions. Computational Statistics & Data Analysis 102, 23-36. Nguyen, H.D. and McLachlan G.J. (2016c). Linear mixed models with marginally symmetric nonparametric random effects. Computational Statistics & Data Analysis 103, 151-169. Nguyen, H.D., McLachlan G.J., Ullmann, J.F.P., and Janke, A.L. (2016a). Laplace mixture autoregressive models. Statistics & Probability Letters 110, 18-24. Nguyen, H.D., McLachlan G.J., Ullmann, J.F.P., and Janke, A.L. (2016b). Spatial clustering of time-series via mixtures of autoregressive models and Markov random fields. Statistica Neerlandica 70, 414-439. Nguyen, H.D., McLachlan, G.J., and Wood, I.A. (2016). Mixtures of spatial spline regressions for clustering and classification. Computational Statistics & Data Analysis 93, 76-85. Ingrassia, S., McLachlan, G.J., and Goveart, G. (Eds.). (2015). Special Issue on New Trends on Model-Based Clustering and Classification. Advances in Data Analysis and Classification 9, 367-502. Lin, T.-I., Wu, P.H., McLachlan, G.J., and Lee, S.X. (2015). A robust factor analysis model using the restricted skew t-distribution . TEST 24, 510-531. McLachlan, G.J. (2015). Multivariate Analysis: Classification and Discriminant Analysis. In International Encyclopedia of Social and Behavorial Sciences, Second Edition, Vol. 16. J.D. Wright (Editor-in-Chief). Oxford: Elsevier Science, pp. 116-120. McLachlan, G.J. (2015). Mixture Models in Statistics. In International Encyclopedia of Social and Behavorial Sciences, Second Edition, Vol. 16. J.D. Wright (Editor-in-Chief). Oxford: Elsevier Science, pp. 9910-9915. McLachlan, G.J. (2015). Computation: Expectation-Maximization Algorithm. In International Encyclopedia of Social and Behavorial Sciences, Second Edition, Vol. 16. J.D. Wright (Editor-in-Chief). Oxford: Elsevier Science, pp. 469-474. Ng, S.K., McLachlan, G.J., Wang, K., Nagymanyoki, Z., Liu, S., and Ng, S.W. (2015). Inference on differential expression using cluster-specific contrasts of mixed effects. Biostatistics 16, 98-112. Nguyen, H.D. and McLachlan G.J. (2015). Maximum likelihood estimation of Gaussian mixture models without matrix operations. Advances in Data Analysis and Classification 9, 371-394. Pyne, S., Lee, S.X., and McLachlan, G.J. (2015). Nature and man: the goal of bio-security in the course of rapid and inevitable human development. Journal of the Indian Society of Agricultural Statistics 69, 117-125. Tian, T., McLachlan, G.J., Dieters, M., and Basford, K.E. (2015). Application of multiple imputation for missing values in three-way three-mode multi-environment trial data. PLoS ONE 10(12): e0144370. Böhning, D., Hennig, C., McLachlan, G.J., and McNicholas, P.D. (Eds.). (2014). The 2nd Special Issue on "Advances in Mixture Models." Computational Statistics & Data Analysis 71, 1-1220. Lee, S. and McLachlan, G.J. (2014). Finite mixtures of multivariate skew t-distributions: some recent and new results. Statistics and Computing 24, 181-202. See also amended version with corrections. ePreprint (2011) arXiv: 1109.4706v2. McLachlan, G.J. and Rathnayake, S.I. (2014). On the number of components in a Gaussian mixture model. Wiley Interdisciplinary Reviews (WIREs): Data Mining and Knowledge Discovery 4, 341-355. Erratum. Ng, S.K. and McLachlan, G.J. (2014). Mixture of random effects models for clustering multilevel growth trajectories . Computational Statistics & Data Analysis 71, 43-51. Nguyen, H.D., McLachlan, G.J., Cherbuin, N., and Janke, A.L. (2014). False discovery rate control in magnetic resonance imaging studies via Markov random fields. IEEE Transactions on Medical Imaging 33, 1735-1748. Pyne, S., Lee, S.X., Wang, K., Irish, J., Tamayo, P., Nazaire, M.-D., Duong, T., Ng, S.K., Hafler, D., Levy, R., Nolan, G.P., Mesirov, J., and McLachlan, G.J. (2014). Joint modeling and registration of cell populations in cohorts of high-dimensional flow cytometric data. PLoS ONE 9(7):e100334. Ng, S.K. and McLachlan, G.J. (2014). Mixture of regression models with latent variables and sparse coefficient parameters. In Proceedings of COMPSTAT 2014, M. Gilli, G. Gonzaléz-Rodríguez, and A. Nieto-Reyes (Eds.). The Hague: The International Statistical Institute/International Association for Statistical Computing, pp. 223-231. Nguyen, H.D. and McLachlan, G.J. (2014). Asymptotic inference for hidden process regression models. In Proceedings of the 2014 IEEE Workshop on Statistical Signal Processing (SSP), Gold Coast, Queensland. Piscataway, New Jersey: IEEE Computer Society, pp. 256-259. Aghaeepour, N., Finak,G., The FLOWCAP Consortium (McLachlan, G.J., et al. ), The DREAM Consortium, Hoos, H., Mosmann, T.R., Gottardo, R., Brinkman, R.R., Scheuermann, R.H. (2013). Critical assessment of automated flow cytometry analysis techniques. Nature Methods 10, 228-238. Basford, K.E., McLachlan, G.J., and Rathnayake, S.I. (2013). 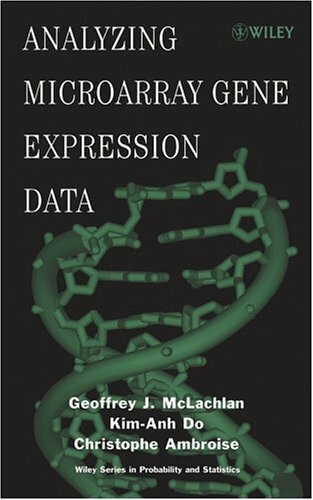 On the classification of microarray gene-expression data . Briefings in Bioinformatics 14, 402-410. Lee, S.X. and McLachlan, G.J. (2013). On mixtures of skew normal and skew t-distributions. Advances in Data Analysis and Classification 7, 241-266. ePreprint (2012) arXiv:1211.3602. Lee, S.X. and McLachlan, G.J. (2013). Model-based clustering and classification with non-normal mixture distributions (with discussion). Statistical Methods & Applications 22, 427-479. Rejoinder. Lee, S.X. and McLachlan, G.J. (2013). EMMIXuskew: an R package for fitting mixtures of multivariate skew t-distributions via the EM algorithm. Journal of Statistical Software 55, No. 12. See also CRAN package. Lee, S.X. and McLachlan, G.J. (2013). Modelling asset return using multivariate asymmetric mixture models with applications to estimation of Value-at-Risk. In Proceedings of the 20th International Congress on Modelling and Simulation, J. Piantadosi, R.S. Anderssen, and J. Boland (Eds.). Melbourne: Modelling and Simulation Society of Australia and New Zealand, pp. 1228-1234. Li, G.-Z., Hu, X., Kim, S., Ressom, H., Hughes, M., Liu, B., McLachlan, G.J., Liebman, M., and Sun, H. (Eds.). Proceedings of the 2013 IEEE International Conference on Bioinformatics and Biomedicine (BIBM 2013). Piscataway, New Jersey: IEEE Computer Society. McLachlan, G.J. (2013). Contribution to the discussion of paper by C. Hennig and T.F. Liao. Applied Statistics 62, 352. McLachlan, G.J. (2013). Discriminant analysis. In The Encyclopedia of Environmetrics (Second Edition). W. Piegorsch and A.-H. El-Shaarawi (Eds). Chichester, United Kingdom: Wiley, pp. 662-672. McLachlan, G.J., Flack, L., Ng, S.K., and Wang, K. (2013). Clustering of gene-expression data via normal mixture models . In Statistical Methods for Microarray Data: Methods and Protocols (Methods in Molecular Biology), A.Y. Yakovlev, L. Klebanov, and D. Gaile (Eds.). Totowa, New Jersey: Humana Press, pp. 103-119. McLachlan, G.J. and Leemaqz, S. (2013). On finite mixtures of skew distributions. In Proceedings of the 28th International Workshop on Statistical Modelling, Vol. 1, V.M.R. Muggeo, V. Capursi, G. Boscaino, and G. Lovison (Eds.). Amsterdam: Statistical Modelling Society, pp. 33-44. Ng, S.K. and McLachlan, G.J. (2013). Using cluster analysis to improve the selection of genes in the formation of discriminant rules for the prediction of disease outcomes. In Proceedings of the 2013 IEEE International Conference on Bioinformatics and Biomedicine (BIBM 2013), G.-Z. Li, X. Hu , S. Kim, H. Ressom, M. Hughes, B. Liu, G. McLachlan, M. Liebman, and H. Sun. (Eds.). Piscataway, New Jersey: IEEE Computer Society, pp. 267-272. Nguyen, H.D., Janke, A.L., McLachlan, G.J., Cherbuin, C., Sachdev, P., and Anstey, K.J. (2013). Spatial false discovery rate control for magnetic resonance imaging studies. In Proceedings of DICTA 2013 (The International Conference on Digital Image Computing: Techniques and Applications), P. de Souza, U. Engelke, and A. Rahman (Eds.). Los Alamitos, California: IEEE eXpress Conference Publishing, pp. 290-297. Sun, M. and McLachlan, G.J. (2013). A common factor-analytic model for classification. In Proceedings of the 2013 IEEE International Conference on Bioinformatics and Biomedicine (BIBM 2013), G.-Z. Li, X. Hu , S. Kim, H. Ressom, M. Hughes, B. Liu, G. McLachlan, M. Liebman, and H. Sun. (Eds.). Piscataway, New Jersey: IEEE Computer Society, pp. 19-24. McLachlan, G.J. (2012). Discriminant analysis. Wiley Interdisciplinary Reviews: Computational Statistics 4, 421-431. McLachlan, G.J. (2012). An enduring interest in classification - supervised and unsupervised . In Journeys to Data Mining: Experiences from 15 Renowned Researchers, M.M. Gaber (Ed.). Berlin: Springer-Verlag, pp. 147-172. Melli, G., Wu, X., Beinat, P., Bonchi, F., Cao, L., Duan, R., Faloutsos, C., Ghani, R., Kitts, B., Goethals, B., McLachlan, G.J., Pei, J., Srivastava, A., and Zaïane, O. (2012). Top-10 data mining case studies. International Journal of Information Technology & Decision Making. 11, 389-400. Ng, S.K., Krishnan, T., and McLachlan, G.J. (2012). Second Edition. The EM algorithm. In Handbook of Computational Statistics: Concepts and Methods Vol. 1, J. Gentle, W. Hardle, and Y. Mori (Eds.). New York: Springer-Verlag, pp. 139-172. Schroder, K., Irvine, K.M., Taylor, M.S., Bokil, N.J., Le Cao, K.-A., Masterman, K.-A., Labzin, L.I., Semple, C.A., Kapetanovic, R., Fairbairn, L., Akalin, A., Faulkner, G.J., Baillie, J.K., Gongora, M., Daub, C.O., McLachlan, G.J., Goldman, N., Grimmond, S.M., Carninci, P., Suzuki, H., Hayashizaki, Y., Lenhard, B., Hume, D.A., and Sweet, M.J. (2012). Conservation and divergence in toll-like receptor 4-regulated gene expression in primary human versus mouse macrophages. Proceedings of the National Academy of Sciences of the USA 109, E944-E953. Wang, K., Ng, S.K., and McLachlan, G.J. (2012). Clustering of time-course gene expression profiles using normal mixture models with autoregressive random effects . BMC Bioinformatics 13: 300. Baek, J. and McLachlan, G.J. (2011). Mixtures of common t-factor analyzers for clustering high-dimensional microarray data. Bioinformatics 27, 1269-1276. McLachlan, G.J. (2011). Commentary on Evaluating mixture modeling for clustering: recommendations and cautions by D. Steinley and M.J. Brusco. Psychological Methods 16, 80-81. McLachlan, G.J., Baek, J., and Rathnayake, S.I. (2011). Mixtures of factor analyzers for the analysis of high-dimensional data. In Mixture Estimation and Applications, K.L. Mengersen, C.P. Robert, and D.M. Titterington (Eds.). Hoboken, New Jersey: Wiley, pp. 171-191. McLachlan, G.J. and Rathnayake, S.I. (2011). Testing for group structure in high-dimensional data. Journal of Biopharmaceutical Statistics 21, 1113-1125. Nikulin, V., Huang, T.-H., and McLachlan, G.J. (2011). Classification of high-dimensional microarray data with a two-step procedure via a Wilcoxon criterion and multilayer perceptron. International Journal of Computational Intelligence and Applications 10, 1-14. Nikulin, V., Huang, T.-H., Ng, S.K., Rathnayake, S.I., and McLachlan, G.J. (2011). A very fast algorithm for matrix factorization. Statistics & Probability Letters 81, 773-782. Zhao, Y., Lee, A.H., Yau, K.K.W., and McLachlan, G.J. (2011). Assessing the adequacy of Weibull survival models: a simulated envelope approach. Journal of Applied Statistics 38, 2089-2097. Baek, J., McLachlan, G.J., and Flack, L. (2010). Mixtures of factor analyzers with common factor loadings: applications to the clustering and visualisation of high-dimensional data. IEEE Transactions on Pattern Analysis and Machine Intelligence 32, 1298-1309. Huang, T.-H., Nikulin, V., and McLachlan, G.J. (2010). On relations between genes and metagenes obtained via gradient-based matrix factorization. In Proceedings of 2010 IEEE/ICME International Conference on Complex Medical Engineering, Gold Coast, Y. Li, J. Yang, P. Wen, and J. Wu (Eds.). Los Alamitos, California: IEEE Computer Society, pp. 17-22. Le Cao, K.-A., Meugnier, E., and McLachlan, G.J. (2010). Integrative mixture of experts to combine clinical factors and gene markers. Bioinformatics 26, 1192-1198. McLachlan, G.J. and Baek, J. (2010). Clustering of high-dimensional data via finite mixture models. In Advances in Data Analysis, Data Handling and Business Intelligence, A. Fink, B. Lausen, W. Seidel, and A. Ultsch (Eds.). Berlin: Springer-Verlag, pp. 33-44. McLachlan, G.J., Ng, S.K., and Wang, K. (2010). Clustering of high-dimensional and correlated data. In Studies in Classification, Data Analysis, and Knowledge Organization: Data Analysis and Classification, C. Lauro, F. Palumbo, and M. Greenacre (Eds.). Berlin: Springer-Verlag, pp. 3-11. McLachlan, G.J. and Wockner, L. (2010). Use of mixture models in multiple hypothesis testing with applications in bioinformatics. In Studies in Classification, Data Analysis, and Knowledge Organization: Classification as a Tool for Research, H. Locarek-Junge and C. Weihs (Eds.). Berlin: Springer-Verlag, pp. 177-184. Ng, S.K. and McLachlan, G.J. (2010). Expert networks with mixed continuous and categorical feature variables: a location modeling approach. In Machine Learning Research Progress, H. Peters and M. Vogel (Eds.). Hauppauge, New York: Nova, pp. 355-368. Nikulin, V., Huang, T.-H., and McLachlan, G.J. (2010). A comparative study of two matrix factorization methods applied to the classification of gene expression rate. In Proceedings of 2010 IEEE International Conference on Bioinformatics and Biomedicine, Hong Kong, T. Park, L. Chen, L. Wong, S. Tsui, M. Ng, and X. Hu (Eds.). Los Alamitos, California: IEEE Computer Society, pp. 618-621. Nikulin, V. and McLachlan, G.J. (2010). A gradient-based algorithm for matrix factorization applied to dimensionality reduction. In Proceedings of BIOSTEC 2010 (the 3rd International Joint Conference on Biomedical Engineering Systems and Technologies, Valencia, Spain), A. Fred, J. Filipe, and H. Gamboa (Eds.). Portugal: Institute for Systems and Technologies of Information, Control and Communication, pp. 147-152. Nikulin, V. and McLachlan, G.J. (2010). Penalized principal component analysis of microarray data. In Lecture Notes in Bioinformatics 6160, F. Masulli, L. Peterson, and R. Tagliaferri (Eds.). Berlin: Springer, pp. 82-96. Nikulin, V. and McLachlan, G.J. (2010). Identifying fibre bundles with regularized k-means clustering applied to grid-based data. In Proceedings of the 2010 International Joint Conference on Neural Networks, Barcelona, V. Piuri (Ed.). Los Alamitos, California: IEEE Computer Society, pp. 2281-2288. Tang, L., Yang, J., Ng, S.K., Rodriguez, N., Choi, P.-W., Vitonis, A., Wang, K., McLachlan, G.J., Caiazzo, R.J., Jr., Liu , B. C.-S., Welch, W.R., Cramer, D.W., Berkowitz, R.S., and Ng, S.W. (2010). Autoantibody profiling to identify biomarkers of key pathogenic pathways in mucinous ovarian cancer. European Journal of Cancer 46, 170-179. Wojnarski, M., Janusz, A., Nguyen, H.S., Bazan, J., Luo, C.J., Chen, Z., Hu, F., Wang, G., Guan, L., Luo, H., Gao, J., Shen, Y., Nikulin, V., Huang, T.-H., McLachlan, G.J., Bosnjak, M., and Gamberger, D. (2010). RSCTC 2010 Discovery Challenge: mining DNA microarray data for medical diagnosis and treatment. In Lecture Notes in Artificial Intelligence 6086 (Proceedings of RSCT 2010), M. Szczuka et al. (Eds.). Berlin: Springer, pp. 4-19. Flack, L.K. and McLachlan, G.J. (2009). Clustering methods for gene-expression data. In Handbook of Research on Systems Biology Applications in Medicine, A. Daskalaki (Ed.). Hershey, Pennsylvania: Idea Group Publishing, pp. 209-220. Le Cao, K.-A. and McLachlan, G.J. (2009). Statistical analysis of microarray data: selection of gene prognosis signatures. In Computational Biology: Issues and Applications in Oncology, T. Pham (Ed.). New York: Springer-Verlag, pp. 55-76. McLachlan, G.J. (2009). Unsupervised data mining: statistical model-based clustering. In Comprehensive Chemometrics: Chemical and Biochemical Data Analysis Vol. 2, S. Brown, R. Tauler, and R. Walczak (Eds.). Oxford: Elsevier, pp. 655-681. McLachlan, G.J. and Ng, S.K. (2009). The EM Algorithm. In The Top-Ten Algorithms in Data Mining, X. Wu and V. Kumar (Eds.). Boca Raton, Florida: Chapman & Hall/CRC, pp. 93-115. Nikulin, V. and McLachlan, G.J. (2009). Classification of imbalanced marketing data with balanced random sets. In Journal of Machine Learning Research: Workshop and Conference Proceedings 7 (Proceedings of KDD-Cup 2009 Competition, Paris), I. Guyon, V. Lemaire, and M. Boulle, G. Dror, and D. Vogel (Eds.). Cambridge, Massachusetts: MIT Press and Microtome Publishing, 89-100. Nikulin, V., McLachlan, G.J., and Ng, S.K. (2009). Ensemble approach for the classification of imbalanced data. In Lecture Notes in Artificial Intelligence 5866 (Proceedings of AI 2009, 22nd Australasian Joint Conference on Artificial Intelligence, Melbourne), A. Nicholson and X. Li (Eds.). Berlin: Springer, pp. 291-300. Nikulin, V. and McLachlan, G.J. (2009). Regularised k-means clustering for dimension reduction applied to supervised classification. In DMI Proceedings Series 3 (Proceedings of CIBB 2009, Sixth International Meeting on Computational Intelligence for Bioinformatics and Biostatistics, Genoa, Italy), F. Masulli, L. Peterson, and R. Tagliaferri (Eds.). Salerno, Italy: DMI (Department of Mathematics and Informatics), University of Salerno, pp. 1-10. Nikulin, V. and McLachlan, G.J. (2009). On a general method for matrix factorisation applied to supervised classification. In Proceedings of 2009 IEEE International Conference on Bioinformatics and Biomedicine Workshop, Washington, D.C., J. Chen et al. (Eds.). Los Alamitos, California: IEEE Computer Society, pp. 43-48. Suarez, E., Burguete, A., and McLachlan, G.J. (2009). Microarray data analysis for differential expression: a tutorial. Puerto Rico Journal of Health Science 28, 89-104. Wang, K., Ng, S.K., and McLachlan, G.J. (2009). Multivariate skew t mixture models: applications to fluorescence-activated cell sorting data. In Proceedings of DICTA 2009 (Conference of Digital Image Computing: Techniques and Applications, Melbourne), H. Shi, Y. Zhang, M.J. Bottema, B.C. Lovell, and A.J. Maeder (Eds.). Los Alamitos, California: IEEE Computer Society, pp. 526-531. Zhao, Y., Lee, A.H., Yau, K.K.W., Burke, V., and McLachlan, G.J. (2009). A score test for assessing the cured proportion in the long-term survivor mixture model. Statistics in Medicine 28, 3454-3466. Baek, J. and McLachlan, G.J. (2008). Mixtures of factor analyzers with common factor loadings for the clustering and visualisation of high-dimensional data. Technical Report NI08018-SCH, Preprint Series of the Isaac Newton Institute for Mathematical Sciences, Cambridge. Caprania, C.C., O'Brien, E., and McLachlan, G.J. (2008). Characteristic traffic load effects from a mixture of loading events on short to medium span bridges. Structural Safety 30, 394-404. Jorgensen, M.A. and McLachlan, G.J. (2008). Wallace's approach to unsupervised learning: the Snob program. Computer Journal 51, 571-578. McLachlan, G.J., Bean, R., and Ng, S.K. (2008). Clustering of microarray data via mixture models. In Statistical Advances in Biomedical Sciences: Clinical Trials, Epidemiology, Survival Analysis, and Bioinformatics, A. Biswas, S. Datta, J.P. Fine, and M.R. Segal (Eds.). Hoboken, New Jersey: Wiley, pp. 365-384. McLachlan, G.J., Bean, R., and Ng, S.K. (2008). Clustering. In Bioinformatics, Vol. 2: Structure, Function, and Applications, J.M. Keith (Ed.). Totowa, New Jersey: Humana Press, pp. 423-439. McLachlan, G.J., Chevelu, J., and Zhu, J. (2008). Correcting for selection bias via cross-validation in the classification of microarray data. In Beyond Parametrics in Interdisciplinary Research: Festschrift in Honour of Professor Pranab K. Sen, N. Balakrishnan, E. Pena, and M.J. Silvapulle (Eds.). Hayward, California: IMS Collections, Vol. 1, pp. 383-395. McLachlan, G.J. and Krishnan, T. (2008). The EM Algorithm and Extensions. Second Edition. Hoboken, New Jersey: Wiley. McLachlan,G.J., Ng, S.K., and Wang, K. (2008). Clustering via mixture regression models with random effects. In Proceedings of COMPSTAT 2008, Porto, Portugal, P. Brito (Ed.). Heidelberg: Springer, 397-407. McLachlan, G.J., Wang, K., and Ng, S.K. (2008). Large-scale simultaneous inference with applications to the detection of differential expression with microarray data (with discussion). Statistica 68, 1-30. McLachlan, G.J., Wang, K., and Ng, S.K. (2008). Contribution to the discussion of the paper by F. Chiaromonte and S. Tyekucheva. Test 17, 43-46. McLaren, C.E., Gordeuk, V.R., Chen, W.-P., Barton, J.C., Acton, R.T., Speechley, M., Castro, O., Adams, P.C., Snively, B.M., Harris, E.M., Reboussin, D.M., Mclachlan, G.J., and Bean, R. (2008). Bivariate mixture modeling of transferrin saturation and serum ferritin concentration in Asians, African Americans, Hispanics, and whites in the Hemochromatosis and Iron Overload Screening (HEIRS) Study. Translational Research 151, 97-109. Wu, X., Kumar, V., Quinlan, J.R., Ghosh, J., Yang, Q., Motoda, H., McLachlan, G.J., Ng, S.K., Liu, B., Yu, P.S., Zhou, Z.-H., Steinbach, M., Hand, D.J., and Steinberg, D. (2008). Top 10 algorithms in data mining. Knowledge and Information Systems 14, 1-37. Zhu, J.X., McLachlan, G.J., Ben-Tovim, L., and Wood, I. (2008). On selection biases with prediction rules formed from gene expression data. Journal of Statistical Planning and Inference 38, 374-386. Baek, J., Son, Y.S., and McLachlan, G.J. (2007). Segmentation and intensity estimation of microarray images using a gamma-t mixture model. Bioinformatics 23, 458-465. Do, K.-A., McLachlan, G.J., Bean, R.W., and Wen, S. (2007). Application of gene shaving and mixture models to cluster microarray gene expression data. Cancer Informatics 2, 1-19. Lee, A.H., Wang, K., Yau, K.K.W., McLachlan, G.J., and Ng, S.K. (2007). Maternity length of stay modelling by gamma mixture regression with random effects. Biometrical Journal 49, 750-764. Lenzenweger, M.F., McLachlan, G.J., and Rubin, D.B. (2007). Resolving the latent structure of schizophrenia endophenotypes using EM-based finite mixture modeling. Journal of Abnormal Psychology 116, 16-29. McLachlan, G.J. (2007). Discriminant analysis. In The Encyclopedia of Measurement and Statistics Vol. 1, N.J. Salkind (Ed.). Thousand Oaks, California: Sage, pp. 267-270. McLachlan, G.J., Bean, R.W., and Ben-Tovim Jones, L. (2007). Extension of the mixture of factor analyzers model to incorporate the multivariate t distribution. Computational Statistics & Data Analysis 51, 5327-5338. Ng, S.K. and McLachlan, G.J. (2007). Extension of mixture-of-experts networks for binary classification of hierarchical data. Artificial Intelligence in Medicine 41, 57-67. Nikulin, V. and McLachlan, G.J. (2007). Merging algorithm to reduce dimensionality in application to web-mining. In Lecture Notes in Artificial Intelligence 4830 (Proceedings of AI 2007, 20th Australian Joint Conference on Artificial Intelligence, Surfers Paradise, Queensland), M.A. Orgun and J. Thornton (Eds.). Berlin: Springer, pp. 755-761. Suarez, E., Sariol, C.A., Burguete, A., and McLachlan, G.J. (2007). A tutorial in genetic epidemiology and some considerations in statistical modeling. Puerto Rico Journal of Health Science 26, 401-421. Wang, K., Yau, K.K.W., Lee, A.H., and McLachlan, G.J. (2007). Two-component Poisson mixture regression modelling of count data with bivariate random effects. Mathematical and Computer Modelling 46, 1468-1476. Wang, K., Yau, K.K.W., Lee, A.H., and McLachlan, G.J. (2007). Multilevel survival modelling of recurrent urinary tract infections. Computer Methods and Programs in Biomedicine 87, 225-229. Xiang, L., Lee, A.H., Yau, K.K.W., and McLachlan, G.J. (2007). A score test for overdispersion in zero-inflated Poisson mixed regression model. Statistics in Medicine 26, 1608-1622. Basford, K.E., McLachlan, G.J., and Bean, R.W. (2006). Issues of robustness and high dimensionality in cluster analysis. In Proceedings of COMPSTAT 2006, Rome, A. Rizzi and M. Vichi (Eds.). New York: Springer, pp. 3-15. Ben-Tovim Jones, L., Bean, R.W., McLachlan, G.J., and Zhu, J.X. (2006). Mixture models for detecting differentially expressed genes in microarrays. International Journal of Neural Systems 16, 353-362. Lee, A.H., Wang, K., Scott, J.A., Yau, K.K.W., and McLachlan, G.J. (2006). Multilevel zero-inflated Poisson regression modelling of correlated count data with excess zeros. Statistical Methods in Medical Research 15, 47-61. McLachlan, G.J., Bean, R.W., and Ben-Tovim Jones, L. (2006). A simple implementation of a normal mixture approach to differential gene expression in multiclass microarrays. Bioinformatics 22, 1608-1615. McLachlan, G.J., Ng, S.K., and Bean, R. (2006). Robust cluster analysis via mixture models. Austrian Journal of Statistics 35, 157-174. Ng, S.K., McLachlan, G.J., Bean, R.W., and Ng, S.W. (2006). Clustering replicated microarray data via mixtures of random effects models for various covariance structures. In Conferences in Research and Practice in Information Technology 73 (Proceedings of WISB 2006, Workshop on Intelligent Systems for Bioinformatics, Hobart), M. Boden and T.L. Bailey (Eds.). Sydney: The Australian Computer Society, pp. 29-33. Ng, S.K., McLachlan, G.J., and Lee, A.H. (2006). An incremental EM-based learning approach for on-line prediction of hospital resource utilization. Artificial Intelligence in Medicine 36, 257-267. Ng, S.K., McLachlan, G.J., Wang, K., Ben-Tovim, L., and Ng, S.W. (2006). A mixture model with random-effects components for clustering correlated gene-expression profiles. Bioinformatics 22, 1745-1752. Ng, S.K., Wang, K., and McLachlan, G.J. (2006). Multilevel modelling for inference of genetic regulatory networks. In Complex Systems in the International Symposium on Microelectronics, MEMS, and Nanotechnology 6039 (Proceedings of SPIE 2005, Brisbane), A. Bender (Ed.). Bellingham, Washington: International Society for Optical Engineering, pp. 60390S-1 - 60390S-12. Xiang, L., Lee, A.H., Yau, K.K.W., and McLachlan, G.J. (2006). A score test for zero-inflation in correlated count data. Statistics in Medicine 25, 1660-1670. Zhu, X., Ambroise, C., and McLachlan, G.J. (2006). Selection bias in working with the top genes in supervised classification of tissue samples. Statistical Methodology 3, 29-41. Bean, R.W. and McLachlan, G.J. (2005). Cluster analysis of high-dimensional data: a case study. In Lecture Notes in Computer Science 3578 (Proceedings of IDEAL 2005, 6th Intelligent Data Engineering and Automated Learning Conference, Brisbane), M. Gallagher, J. Hogan, and F. Maire (Eds.). Berlin: Springer, pp. 302-310. Ben-Tovim Jones, L., Bean, R.W., McLachlan, G.J., and Zhu, J. (2005). Application of mixture models to detect differentially expressed genes. In Lecture Notes in Computer Science 3578 (Proceedings of IDEAL 2005, 6th Intelligent Data Engineering and Automated Learning Conference, Brisbane), M. Gallagher, J. Hogan, and F. Maire (Eds.). Berlin: Springer, pp. 422-431. Ben-Tovim Jones, L., Ng, S.K., Ambroise, C., Monico, K., Khan, N., and McLachlan, G.J. (2005). Use of microarray data via model-based classification in the study and prediction of survival from lung cancer. In Methods of Microarray Data Analysis IV, J.S. Shoemaker and S.M. Lin (Eds.). New York: Springer, pp. 163-173. Kerr, R.J., McLachlan, G.J., and Henshall, J.M. (2005). Use of the EM algorithm to detect QTL affecting multiple-traits in a n across half-sib family analysis. Genetics Selection Evolution 37, 83-103. McLachlan, G.J., Bean, R.W., Ben-Tovim Jones, L., and Zhu, X. (2005). Using mixture models to detect differentially expressed genes. Australian Journal of Experimental Agriculture 45, 859-866. Ng, S.K. and McLachlan, G.J. (2005). Normalized Gaussian networks with mixed feature data. In Lecture Notes in Artificial Intelligence 3809 (Proceedings of AI 2005, 18th Australian Joint Conference on Artificial Intelligence, Sydney), S. Zhang and R. Jarvis (Eds.). Berlin: Springer, pp. 879-882. Ng, S.K. and McLachlan, G.J. (2004). Mixture model-based statistical pattern recognition of clustered or longitudinal data. In Proceedings of WDIC2005 (APRS Workshop on Digital Image Computing, Brisbane), B.C. Lovell and A. Maeder (Eds.). Brisbane: Australian Pattern Recognition Society, pp. 139-144. McLachlan, G.J., Do, K.-A., and Ambroise, C. (2004). Analyzing Microarray Gene Expression Data. Hoboken, New Jersey: Wiley. Ben-Tovim Jones, L., Ng, S.K., Monico, K., and McLachlan, G.J. (2004). Linking gene-expression experiments with survival-time data. In Statistical Modelling, Proceedings of the 19th International Workshop on Statistical Modelling. A. Biggeri, E. Dreassi, C. Lagazio, and M. Marchi (Eds.). Florence: Firenze University Press, pp. 71-75. McLachlan, G.J. and Bean, R. (2004). Contribution to the discussion of paper by J. Friedman and J. Meulman. Journal of the Royal Statistical Society B 66, 846. McLachlan, G.J. and Chang, S.U. (2004). Mixture modelling for cluster analysis. Statistical Methods in Medical Research 13, 347-361. McLachlan, G.J., Chang, S.U., Mar, J., and Ambroise, C. (2004). On the simultaneous use of clinical and microarray expression data in the cluster analysis of tissue samples. In Conferences in Research and Practice in Information Technology Vol. 29, Y.-P. Chen (Ed.). Sydney: The Australian Computer Society, pp. 167-171. McLachlan, G.J. and Khan, N. (2004). On a resampling approach for tests on the number of clusters with mixture model-based clustering of tissue samples. Journal of Multivariate Analysis 90, 90-105. McLachlan, G.J., Ambroise, C., Ben-Tovim Jones, L., and Zhu, J. (2004). Supervised learning methods for gene-expression data. In Computing Science and Statistics Vol. 36. Fairfax Station, Virginia: Interface Foundation of North America. McLachlan, G.J., Ng, S.K., and Bean, R.W. (2004). Robust mixture modeling. Proceedings of the American Statistical Association, Physical and Engineering Sciences Section [CD-ROM], Toronto, August 2004. Alexandria, Virginia: American Statistical Association, pp. 2044-2055. Ng, S.K., Krishnan, T., and McLachlan, G.J. (2004). The EM algorithm. In Handbook of Computational Statistics Vol. 1, J. Gentle, W. Hardle, and Y. Mori (Eds.). New York: Springer-Verlag, pp. 137-168. Ng, S.K.and McLachlan, G.J. (2004). Using the EM algorithm to train neural networks: misconceptions and a new algorithm for multiclass classification. IEEE Transactions on Neural Networks 15, 738-749. Ng, S.K. and McLachlan, G.J. (2004). Speeding up the EM algorithm for mixture model-based segmentation of magnetic resonance images. Pattern Recognition 37, 1573-1589. Ng, S.K., McLachlan, G.J., Yau, K.K.W., and Lee, A.H. (2004). Modelling the distribution of ischaemic stroke-specific survival time using an EM-based mixture approach with random effects adjustment. Statistics in Medicine 23, 2729-2744. Kim, S.-G., Ng, S.K., McLachlan, G.J., and Wang, D. (2003). Segmentation of brain MR images with bias-field correction. In Proceedings of WDIC2003, APRS Workshop on Digital Image Computing, B.C. Lovell and A. Maeder (Eds.). Brisbane: Australian Pattern Recognition Society, pp. 3-8. Mar, J.C. and McLachlan, G.J. (2003). Model-based clustering in gene expression microarrays: an application to breast cancer data. International Journal of Software Engineering and Knowledge Engineering 13, 579-592. Mar, J.C. and McLachlan, G.J. (2003). Model-based clustering in gene expression microarrays: an application to breast cancer data. In Conferences in Research and Practice in Information Technology Vol. 19, Y.-P. Chen (Ed.). Sydney: The Australian Computer Society, pp. 139-144. McLachlan, G.J., Ng, S.K., and Peel, D. (2003). On clustering by mixture models. In Studies in Classification, Data Analysis, and Knowledge Organization: Exploratory Data Analysis in Empirical Research, O. Opitz and M. Schwaiger (Eds.). Berlin: Springer-Verlag, pp. 141-148. McLachlan, G.J., Peel, D., and Bean, R.W. (2003). Modelling high-dimensional data by mixtures of factor analyzers. Computational Statistics & Data Analysis 41, 379-388. Ng, S.K. and McLachlan, G.J. (2003). On the choice of the number of blocks with the incremental EM algorithm for the fitting of normal mixtures. Statistics and Computing 13, 45-55. Ng, S.K.and McLachlan, G.J. (2003). An EM-based semiparametric mixture model approach to the regression analysis of competing-risks data. Statistics in Medicine 22, 1097-111. Ng, S.K. and McLachlan, G.J. (2003). On some variants of the EM algorithm for the fitting of finite mixture models. Austrian Journal of Statistics 32, 143-161. Ng, S.K. and McLachlan, G.J. (2003). Robust estimation in Gaussian mixtures using multiresolution kd-trees. In Proceedings of DICTA 2003, 7th Conference of Digital Image Computing: Techniques and Applications Vol. 1, C. Sun, H. Talbot, S. Ourselin, and T. Adriaansen (Eds.). Sydney: Australian Pattern Recognition Society, pp. 145-154. Ambroise, C. and McLachlan, G.J. (2002). Selection bias in gene extraction on the basis of microarray gene expression data. Proceedings of the National Academy of Sciences USA 99, 6562-6566. Cadez, I.V., Smyth, P., McLachlan, G.J., and McLaren, C.E. (2002). Maximum likelihood estimation of mixture densities for binned and truncated multivariate data. Machine Learning 47, 7-34. McLachlan, G.J., Bean, R.W., and Peel, D. (2002). A mixture model-based approach to the clustering of microarray expression data. Bioinformatics 18, 413-422. McLachlan, G.J. and Hamaty, K.L. (2002). Contribution to the discussion of paper by N. Wang and A.E. Raftery. Journal of the American Statistical Association 97, 1009-1011. Ng, S.K.and McLachlan, G.J. (2002). On speeding up the EM algorithm in pattern recognition: a comparison of incremental and multiresolution kd-tree-based approaches. In Proceedings of DICTA 2002, 6th Conference of Digital Image Computing: Techniques and Applications, D. Suter and A. Bab-Hadiashar (Eds.). Melbourne: Australian Pattern Recognition Society, pp. 116-121. Ng, S.K., O'Brien, M.F., Harrocks, S., and McLachlan, G.J. (2002). The influence of patient age and implantation technique on the probability of re-replacement of the allograft aortic valve (with discussion). Journal of Heart Valve Disease 11, 217-223. McLachlan, G.J. (2001). Multivariate analysis: Classification and discriminant analysis. In International Encyclopedia of Social and Behavioral Sciences Vol. 15, N.J. Smelser and P.B. Baltes (Eds.). Oxford: Elsevier Science, pp. 10214-10218. McLachlan, G.J. (2001). On the grouping of treatments following an ANOVA. (Letter to the Editor). Journal of Agricultural, Biological, and Environmental Statistics 6, 302-304. Peel, D., Whiten, W.J., and McLachlan, G.J. (2001). Fitting mixtures of Kent distributions to aid in joint set identification. Journal of the American Statistical Association 96, 56-63. Rose, S.E., Chalk, J.B., Griffin, M.P., Janke, A.L., Chen, F., McLachlan, G.J., Peel, D., Zelaya, F.O., Markus H.S., Jones, D.K., Simmons, A., O'Sullivan M., Jarosz, J.M., Strugnell, W., Doddrell, D.M., and Semple, J. (2001). MRI based diffusion and perfusion predictive model to estimate stroke evolution. Magnetic Resonance Imaging 19, 1043-1053. McLachlan, G.J. and Peel, D. (2000). Finite Mixture Models. New York: Wiley. xxii + 419 pp. McLachlan, G.J. and Peel, D. (2000). Mixtures of factor analyzers. In Proceedings of the Seventeenth International Conference on Machine Learning, P. Langley (Ed.). San Francisco: Morgan Kaufmann, pp. 599-606. McLachlan, G.J. and Peel, D. (2000). On computational aspects of clustering via mixtures of normal and t-components. Proceedings of the American Statistical Association (Bayesian Statistical Science Section), Indianapolis, August 2000. Alexandria, Virginia: American Statistical Association. McLaren, C.E., Cadez, I.V., Smyth, P., and McLachlan, G.J. (2000). Multivariate mixture models for classification of anemias. Proceedings of the American Statistical Association (Biometrics Section), Indianapolis, August 2000. Alexandria, Virginia: American Statistical Association, pp. 112-117. McLaren C.E., Kambour, E.L. McLachlan, G.J., Lukaski, H.C., Li, X., Brittenham, G.M., and McLaren, G.D. (2000). Patient-specific analysis of sequential hematological data by multiple linear regression and mixture distribution modeling. Statistics in Medicine 19, 83-98. Peel, D. and McLachlan. G.J. (2000). Robust mixture modelling using the t distribution. Statistics and Computing 10, 339-348. Welham, J., McLachlan, G.J., Davies, G., and McGrath, J. (2000). Heterogeneity in schizophrenia; mixture modelling of age-at-first-admission, gender and diagnosis. Acta Psychiatrica Scandinavica 10, 312-317. Cadez, I.V., McLaren, C.E., Smyth, P., and McLachlan, G.J. (1999). Hierarchical models for screening of iron deficiency anemia. In Proceedings of the Sixteenth International Conference on Machine Learning, I. Bratko and S. Dzeroski (Eds.). San Francisco: Morgan Kaufmann, pp. 77-86. McLachlan, G.J. (1999). Mahalanobis Distance. Resonance 4, 20-26. McLachlan, G.J. and Peel, D. (1999). Computing issues for the EM algorithm in mixture models. In Computing Science and Statistics Vol. 31, K. Berk and M. Pourahmadi (Eds.). Fairfax Station, Virginia: Interface Foundation of North America, pp. 421-430. McLachlan, G.J., Peel, D., Basford, K.E., and Adams, P. (1999). The EMMIX software for the fitting of mixtures of normal and t-components. Journal of Statistical Software 4, No. 2. Ng, S.K., McLachlan, G.J., McGiffin, D.C., and O'Brien, M.F. (1999). Constrained mixture models in competing risks problems. Environmetrics 10, 753-767. Feelders, A.J., Chang, S., and McLachlan, G.J. (1998). Mining in the presence of selectivity bias and its application to reject inference. In Proceedings of the Fourth International Conference on Knowledge Discovery and Data Mining, R. Agrawal, P. Stolorz, and G. Piatetsky-Shapiro (Eds.). Menlo Park, California: AAAI Press, pp. 199-203. McDonald, S. and McLachlan, G.J. (1998). Training feed-forward neural networks through hidden representations using the EM algorithm. Proceedings of the Second ASOR Queensland Conference, Brisbane, December 1998. Brisbane: Australian Society for Operations Research, pp. 133-149. McLachlan, G.J. and Peel, D. (1998). Robust cluster analysis via mixtures of multivariate t-distributions. In Lecture Notes in Computer Science Vol. 1451, A. Amin, D. Dori, P. Pudil, and H. Freeman (Eds.). Berlin: Springer-Verlag, pp. 658-666. McLachlan, G.J. and Peel, D. (1998). MIXFIT: an algorithm for the automatic fitting and testing of normal mixture models. In Proceedings of the 14th International Conference on Pattern Recognition Vol. I, A.K. Jain, S. Venkatesh, and B. Lovell (Eds.). Los Alamitos, California: IEEE Computer Society, pp. 553-557. McLachlan, G.J. and Peel, D. (1998). Mixture models and neural networks for clustering. In Proceedings of the Ninth Australian Conference on Neural Networks, T. Downs, M. Frean, and M. Gallagher (Eds.). Brisbane: Department of Computer Science and Electrical Engineering, University of Queensland, pp. 109-113. McLaren, C.E., McLachlan, G.J., Halliday, J.W., Webb, S.I., Leggett, B.A., Jazwinska, E.C., Crawford, D.H.G., Gordeuk, V.R., McLaren, G.D., and Powell, L.W. (1998). The distribution of transferrin saturation and hereditary haemochromatosis in Australians. Gastroenterology 114, 543-549. Ng, S.K. and McLachlan, G.J. (1998). On modifications to the long-term survival mixture model in the presence of competing risks. Journal of Statistical Computation and Simulation 61, 77-96. Basford, K.E., Greenway, D.R., McLachlan, G.J., and Peel, D. (1997). Standard errors of fitted means under normal mixture models. Computational Statistics 12, 1-17. Basford, K.E., McLachlan, G.J., and York. M.G. (1997). Modelling the distribution of stamp paper thickness via finite normal mixtures: the 1872 Hidalgo stamp issue of Mexico revisited. Journal of Applied Statistics 24, 169-179. Hawkins, D.M. and McLachlan, G.J. (1997). High-breakdown linear discriminant analysis. Journal of the American Statistical Association 92, 136-143. McGiffin, D.C., Galbraith, A.J., O'Brien, M.F., McLachlan, G.J., Naftel, D.C., Adams, P., Reddy, S., and Early, L. (1997). An analysis of valve re-replacement following aortic valve replacement with biological devices. Journal of Thoracic and Cardiovascular Surgery 113, 311-318. McLachlan, G.J. (Ed.). (1997). Special Issue on the "Impact of the EM Algorithm on Medical Statistics." Statistical Methods in Medical Research 6, 1-98. McLachlan, G.J. (1997). On the EM algorithm for overdispersed count data. Statistical Methods in Medical Research 6, 76-98. McLachlan, G.J. and Krishnan, T. (1997). 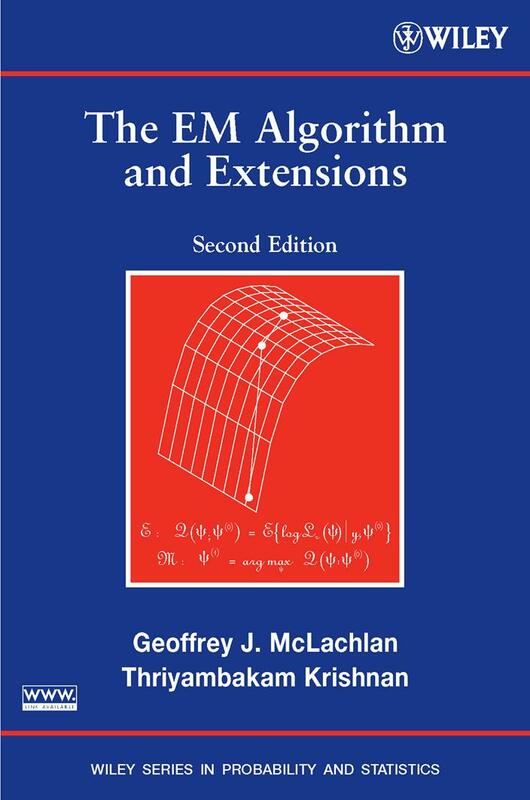 The EM Algorithm and Extensions. New York: Wiley. xvii + 274 pp. McLachlan, G.J., Ng, S.K., Adams, P., McGiffin, D.C., and Galbraith, A.J. (1997). An algorithm for fitting mixtures of Gompertz distributions to censored survival data. Journal of Statistical Software 2, No. 7. McLachlan, G.J. and Peel, D. (1997). Contribution to the discussion of paper by S. Richardson and P.J. Green. Journal of the Royal Statistical Society Series B 59, 779-780. McLachlan, G.J. and Peel, D. (1997). On a resampling approach to choosing the number of components in normal mixture models. In Computing Science and Statistics Vol. 28, L. Billard and N.I. Fisher (Eds.). Fairfax Station, Virginia: Interface Foundation of North America, pp. 260-266. McLachlan, G.J., Peel, D., and Prado, P. (1997). Clustering via normal mixture models. Proceedings of the American Statistical Association (Bayesian Statistical Science Section), Anaheim, August 1997. Alexandria, Virginia: American Statistical Association, pp. 98-103. McLachlan, G.J. (1996). Likelihood-based approaches to pattern recognition. Far East Journal of Mathematical Sciences Bhattacharya Memorial Volume, 1-29. McLachlan, G.J. (1996). On Aitken's method and other approaches for accelerating convergence of the EM algorithm. Proceedings of the A.C. Aitken Centenary Conference, University of Otago, August 1995. Dunedin: University of Otago Press, pp. 201-209. McLachlan, G.J., Ng, S.K., Galloway, G., and Wang, D. (1996). Clustering of magnetic resonance images. Proceedings of the American Statistical Association (Statistical Computing Section), Chicago, August 1996. Alexandria, Virginia: American Statistical Association, pp. 12-17. McLachlan, G.J., Ng, S.K., Galloway, G., and Wang, D. (1996). A mixture model-based approach to the segmentation of MR images of the human brain. Proceedings of Image Segmentation Workshop, University of Technology Sydney, December 1996. Sydney: Australian Pattern Recognition Society, pp. 33-40. McLachlan, G.J. and Peel, D. (1996). An algorithm for unsupervised learning via normal mixture models. In ISIS: Information, Statistics and Induction in Science, D.L. Dowe, K.B. Korb, and J.J. Oliver (Eds.). Singapore: World Scientific Publishing, pp. 354-363. McLachlan G.J., Peel, D., and Whiten, W.J. (1996). Maximum likelihood clustering via finite mixture models. Signal Processing: Image Communication 8, 105-111. McLachlans, G.J. (1995). Mixtures -- models and applications. In The Exponential Distribution: Theory, Methods, and Applications, N. Balakrishnan and A.P. Basu (Eds.). Basel: Gordon & Breach, pp. 307-315. McLachlan, G.J., McLaren, C.E., and Matthews, D. (1995). An algorithm for the likelihood ratio test of one versus two components in a mixture model fitted to grouped and truncated data. Communications in Statistics - Simulation and Computation 24, 965-985. McLachlan, G.J. and Scot, D. (1995). On the asymptotic relative efficiency of the linear discriminant function under partial nonrandom classification of the training data. Journal of Statistical Computation and Simulation 52, 415-426. Ng. S.K., McLachlan, G.J., Galloway, G., and Rose. S.E. (1995). A mixture model approach to segmentation of magnetic resonance images. In Proceedings of DICTA 95, 3rd Conference of Digital Image Computing: Techniques and Applications, A. Maeder and B. Lovell (Eds.). Brisbane: Australian Pattern Recognition Society, pp. 588-593. Lawoko, C.R.O. and McLachlan (1994). Estimation of mixing proportions in the presence of autoregressively correlated training data. Communications in Statistics - Simulation and Computation 23, 591-613. McLachlan, G.J. (1994). One hundred years of mixtures. Stats No. 12, 6-12. McLachlan, G.J. (1994). Contribution to the discussion of paper by B.D. Ripley. Journal of the Royal Statistical Society Series B 56, 447-448. McLachlan, G.J. and McGiffin, D.C. (1994). On the role of finite mixture models in survival analysis. Statistical Methods in Medical Research 3, 211-226. Ray, M.J., Hawson, G.A.T., Just, S.J.E., McLachlan, G.J., and O'Brien, M.F. (1994). The relationship of platelet aggregation to bleeding after cardiopulmonary bypass surgery. Annals of Thoracic Surgery 57, 981-986. Shoukri, M.M. and McLachlan, G.J. (1994). Parametric estimation in a genetic mixture model with application to nuclear family data. Biometrics 50, 128-139. McGiffin, D.C., O'Brien, M.F., Galbraith, A.J., McLachlan, G.J., Stafford, E.G., Gardiner, M.A.H., Pohlner, P.G., Early, L., and Kear, L. (1993). An analysis of risk factors for death and mode-specific death following aortic valve replacement using allograft, xenograft and mechanical valves. Journal of Thoracic and Cardiovascular Surgery 106, 895-911. McLachlan, G.J. (1993). On a connection between the logit model, normal discriminant analysis, and multivariate normal mixtures (Letter to the Editor). American Statistician 47, 88. Jones, P.N. and McLachlan, G.J. (1992). Improving the convergence rate of the EM algorithm for a mixture model fitted to grouped truncated data. Journal of Statistical Computation and Simulation 43, 31-44. Jones, P.N. and McLachlan, G.J. (1992). Fitting finite mixture models in a regression context. Australian Journal of Statistics 34, 233-240. McGiffin, D.C., Galbraith, A.J., McLachlan, G.J., Stower, R.E., Wong, M.C., Stafford, E.G., Gardner, M.A.H., Pohlner, P.G., and O'Brien, M.F. (1992). Aortic valve infection--risk factors for death and recurrent endocarditis following aortic valve replacement. Journal of Thoracic and Cardiovascular Surgery 104, 511-520. McLachlan, G.J. (1992). Discriminant Analysis and Statistical Pattern Recognition. New York: Wiley. xv + 526 pp. McLachlan, G.J. (1992). The use of cluster analysis and related techniques in medicine. Statistical Methods in Medical Research 1, 27-48. Jones, P.N. and McLachlan, G.J. (1991). Fitting mixture distributions to Phenylthiocarbamide (PTC) sensitivity. American Journal of Human Genetics 48, 117-120. McGiffin, D.C. and McLachlan, G.J. (1991). The analysis of time-related events after cardiac surgery. Australian Journal of Cardiac and Thoracic Surgery 1, 11-13. O'Brien, M.F., McGiffin, D.C., Stafford, E.G., Gardner, M.A.H., Pohlner, P.G., McLachlan, G.J., Gall, K., Smith, S., and Murphy, E. (1991). Allograft aortic valve replacement: long-term comparative clinical analysis of the viable cryopreserved and antibiotic 4o C stored valves. Journal of Cardiac Surgery 6, 534-543. Basford, K.E. and McLachlan, G.J. (1990). Cluster analysis of three-way data for the interpretation of agricultural adaptation experiments. In Analysis of Data from Agricultural Adaptation Experiments, I.H. DeLacy (Ed.). Bangkok: Australian Cooperation with the Thai World Bank National Agricultural Research Project, pp. 186-184. Jones, P.N. and McLachlan, G.J. (1990). Laplace-normal mixtures fitted to wind shear data. Journal of Applied Statistics 17, 271-276. Jones, P.N. and McLachlan, G.J. (1990). Algorithm AS 254. Maximum likelihood estimation from grouped and truncated data with finite normal mixture models. Journal of the Royal Statistical Society Series C (Applied Statistics) 39, 273-282. Jones, P.N. and McLachlan, G.J. (1989). Modelling mass-size particle data by finite mixtures. Communications in Statistics - Theory and Methods 18, 2629-2646. Lawoko, C.R.O. and McLachlan, G.J. (1989). Bias associated with the discriminant analysis approach to the estimation of mixing proportions. Pattern Recognition 22, 763-766. McLachlan, G.J. and Gordon, R.D. (1989). Mixture models for partially unclassified data: a case study of renal venous renin levels in essential hypertension. Statistics in Medicine 8, 1291-1300. Lawoko, C.R.O. and McLachlan, G.J. (1988). Further results on discrimination with autocorrelated observations. Pattern Recognition 21, 69-72. McLachlan, G.J. (1988). On the choice of starting values for the EM algorithm in fitting mixture models. Statistician 37, 417-425. McLachlan, G.J. and Basford, K.E. (1988). Mixture Models: Inference and Applications to Clustering. New York: Marcel Dekker. xi + 259 pp. McLachlan, G.J. and Jones, P.N. (1988). Fitting mixture models to grouped and truncated data via the EM algorithm. Biometrics 44, 571-578. McLachlan, G.J. (1987). On bootstrapping the likelihood ratio test statistic for the number of components in a normal mixture. Journal of the Royal Statistical Society Series C (Applied Statistics) 36, 318-324. McLachlan, G.J. (1987). Error rate estimation in discriminant analysis: recent advances. In Advances in Multivariate Statistical Analysis, A.K. Gupta (Ed.). Dordrecht: Reidel, pp. 233-252. Quinn, B.G., McLachlan, G.J., and Hjort, N.L. (1987). A note on the Aitkin-Rubin approach to hypothesis testing in mixture models. Journal of the Royal Statistical Society Series B 49, 311-314. Lawoko, C.R.O. and McLachlan, G.J. (1986). Asymptotic error rates of the W and Z statistics when the training observations are dependent. Pattern Recognition 19, 467-471. McLachlan, G.J. (1986). Assessing the performance of an allocation rule. Computers & Mathematics with Applications 12A, 261-272. Reprinted in Statistical Methods of Discrimination and Classification: Advances in Theory and Applications, S.C. Choi (Ed.). New York: Pergamon Press, pp. 261-272. Basford, K.E. and McLachlan, G.J. (1985). Estimation of allocation rates in a cluster analysis context. Journal of the American Statistical Association 80, 286-293. Basford, K.E. and McLachlan, G.J. (1985). 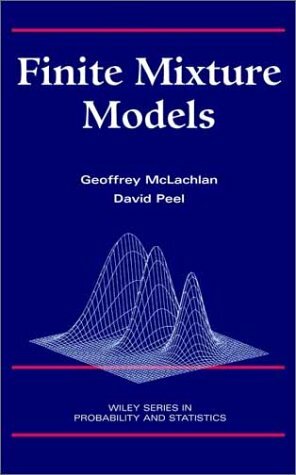 Likelihood estimation for normal mixture models. Journal of the Royal Statistical Society Series C (Applied Statistics) 34, 282-289. Basford, K.E. and McLachlan, G.J. (1985). The mixture method of clustering applied to three-way data. Journal of Classification 2, 109-125. Basford, K.E. and McLachlan, G.J. (1985). Cluster analysis in a randomized complete block design. Communications in Statistics - Theory and Methods 14, 451-463. Lawoko, C.R.O. and McLachlan, G.J. (1985). Discrimination with autocorrelated observations. Pattern Recognition 8, 145-149. McLachlan, G.J. (1985). Asymptotic conditional biases of logistic regression parameters (Letter to the Editor). Statistics in Medicine 4, 244-245. Do, K. and McLachlan, G.J. (1984). Estimation of mixing proportions: a case study. Journal of the Royal Statistical Society Series C (Applied Statistics) 33, 134-140. Basford, K.E. and McLachlan, G.J. (1983). On computational aspects associated with bias correction techniques in a cluster analysis context. Proceedings of STATCOMP 83, Sydney, July 1983. Sydney: Statistical Society of Australia (Statistical Computing Section), pp. 31-39. Lawoko, C.R.O. and McLachlan, G.J. (1983). Some asymptotic results on the effect of autocorrelation on the error rates of the sample linear discriminant function. Pattern Recognition 16, 119-121. McLachlan, G.J. (1982). The classification and mixture maximum likelihood approaches to cluster analysis. In Handbook of Statistics Vol. 2, P.R. Krishnaiah and L. Kanal (Eds.). Amsterdam: North-Holland, pp. 199-208. McLachlan, G.J. (1982). On the bias and variance of some proportion estimators. Communications in Statistics - Simulation and Computation 11, 715-726. McLachlan, G.J. and Ganesalingam, S. (1982). Updating a discriminant function on the basis of unclassified data. Communications in Statistics - Simulation and Computation 11, 753-767. McLachlan, G.J., Lawoko, C.R.O., and Ganesalingam, S. (1982). On the likelihood ratio test for compound distributions for homogeneity of mixing proportions. Technometrics 24, 331-334. Ganesalingam, S. and McLachlan, G.J. (1981). Some efficiency results on the estimation of the mixing proportion in a mixture of two normal distributions. Biometrics 37, 23-33. Byth, K. and McLachlan, G.J. (1980). Logistic regression compared to normal discrimination for non-normal populations. Australian Journal of Statistics 22, 188-196. Ganesalingam, S. and McLachlan, G.J.(1980). Error rate estimation on the basis of posterior probabilities. Pattern Recognition 11, 405-413. Ganesalingam, S. and McLachlan, G.J. (1980). A comparison of the mixture and classification approaches to cluster analysis. Communications in Statistics - Theory and Methods A9, 923-933. McLachlan, G.J. (1980). A note on bias correction in maximum likelihood estimation with logistic discrimination. Technometrics 22, 621-627. McLachlan, G.J. (1980). On the relationship between the F-test and the overall error rate for variable selection in two-group discriminant analysis. Biometrics 36, 501-510. McLachlan, G.J. (1980). The efficiency of Efron's bootstrap approach applied to error rate estimation in discriminant analysis. Journal of Statistical Computation and Simulation 10, 273-279. McLachlan, G.J. (1980). On the mean square error associated with adaptive generalized ridge regression. Biometrical Journal 22, 125-129. McLachlan, G.J. (1980). Selection of variables in discriminant analysis (Letter to the Editor). Biometrics 36, 554. McLachlan, G.J. (1980). Estimation of mixing proportions by the EM algorithm. Proceedings of the American Statistical Association (Statistical Computing Section), Houston, August 1980. Washington, D.C.: American Statistical Association, pp. 140-143. McLachlan, G.J. and Holt, J.N. (1980). The covariance analysis of some censored survival data from a large scale study of melanoma. Australian Journal of Statistics 22, 237-249. Ganesalingam, S. and McLachlan, G.J. (1979). A case study of two clustering methods based on maximum likelihood. Statistica Neerlandica 33, 81-90. Ganesalingam, S. and McLachlan, G.J. (1979). Small sample results for a linear discriminant function estimated from a mixture of normal populations. Journal of Statistical Computation and Simulation 9, 151-158. McLachlan, G.J. (1979). A comparison of the estimative and predictive methods of estimating posterior probabilities. Communications in Statistics - Theory and Methods A8, 919-929. McLachlan, G.J. and Byth, K. (1979). Expected error rates for logistic regression versus normal discriminant analysis. Biometrical Journal 21, 47-56. Byth, K. and McLachlan, G.J. (1978). The biases associated with maximum likelihood methods of estimation of the multivariate logistic risk function. Communications in Statistics - Theory and Methods A7, 877-890. Ganesalingam, S. and McLachlan, G.J. (1978). The efficiency of a linear discriminant function based on unclassified initial samples. Biometrika 65, 658-662. McLachlan, G.J. (1978). Small sample results for partial classification with the Studentized statistic W. Biometrical Journal 20, 639-644. McLachlan, G.J. (1977). Estimating the linear discriminant function from initial samples containing a small number of unclassified observations. Journal of the American Statistical Association 72, 403-406. McLachlan, G.J. (1977). A note on the choice of a weighting function to give an efficient method for estimating the probability of misclassification. Pattern Recognition 8, 147-149. McLachlan, G.J. (1977). Constrained sample discrimination with the Studentized classification statistic W. Communications in Statistics - Theory and Methods A6, 575-583. McLachlan, G.J. (1977). The bias of sample based posterior probabilities. Biometrical Journal 19, 421-426. McLachlan, G.J. (1976). The bias of the apparent error rate in discriminant analysis. Biometrika 63, 239-244. McLachlan, G.J. (1976). A criterion for selecting variables for the linear discriminant function. Biometrics 32, 529-535. McLachlan, G.J. (1976). Further results on the effect of intraclass correlation among training samples in discriminant analysis. Pattern Recognition 7, 273-275. McLachlan, G.J.(1975). Iterative reclassification procedure for constructing an asymptotically optimal rule of allocation in discriminant analysis. Journal of the American Statistical Association 70, 365-369. McLachlan, G.J. (1975). Confidence intervals for the conditional probability of misallocation in discriminant analysis. Biometrics 31, 161-1267. McLachlan, G.J. (1975). Some expected values for the error rates of the sample quadratic discriminant function. Australian Journal of Statistics 17, 161-165. McLachlan, G.J. (1974). The asymptotic distributions of the conditional error rate and risk in discriminant analysis. Biometrika 61, 131-135. McLachlan, G.J. (1974). Estimation of the errors of misclassification on the criterion of asymptotic mean square error. Technometrics 16, 255-260. McLachlan, G.J. (1974). An asymptotic unbiased technique for estimating the error rates in discriminant analysis. Biometrics 30, 239-249. McLachlan, G.J. (1974). The relationship in terms of asymptotic mean square error between the separate problems of estimating each of the three types of error rate of the linear discriminant function. Technometrics 16, 569-575. McLachlan, G.J. (1973). An asymptotic expansion of the expectation of the estimated error rate in discriminant analysis. Australian Journal of Statistics 15, 210-214. McLachlan, G.J. (1972). Asymptotic results for discriminant analysis when the initial samples are misclassified. Technometrics 14, 415-422. McLachlan, G.J. (1972). An asymptotic expansion for the variance of the errors of misclassification of the linear discriminant function. Australian Journal of Statistics14, 68-72.